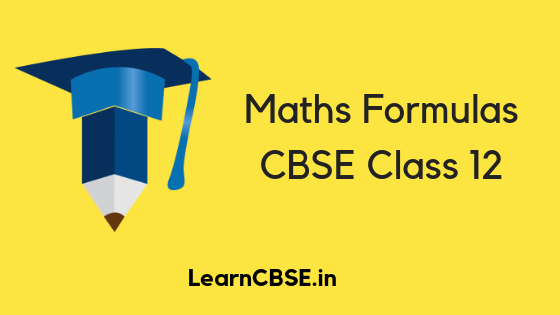 CBSE Class 12 Maths Formulas available for Chapter wise on LearnCBSE.in. Download the important Maths Formulas and equations PDF to solve the problems easily and score more marks in your Class 12 Maths CBSE Board Exams. CBSE Class 12 Maths Formulas are given below for all chapter. Select chapter to view Important Formulas chapter wise. We hope that our CBSE Class 12 Maths Formulas helped with your studies! If you liked our CBSE Class 12 Maths Formulas, please share this post if you have any queries drop a comment below and we will get back to you at the earliest.